This beautiful arrangement of 30 flowers in a basket will be an ideal gift for your dear ones in India on any occasion or festival. 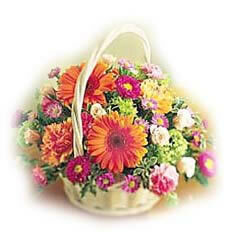 The colorful and vibrant colors of the gerberas and roses will surely bring a smile on the recipient's face. Furthermore, you can also send this arrangement along with other Gifts to India as well.